Hughie and Gráinne met in Coppers and, like so many great Irish love stories before it, that's where their romance began. 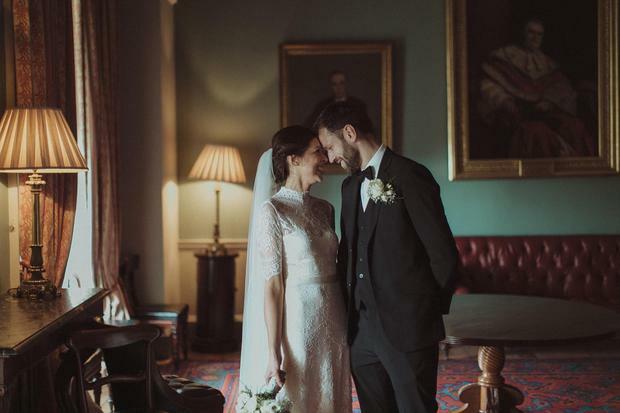 Although Gráinne is quick to add that while she considered herself a 'regular', it was her groom's "first and only time there." 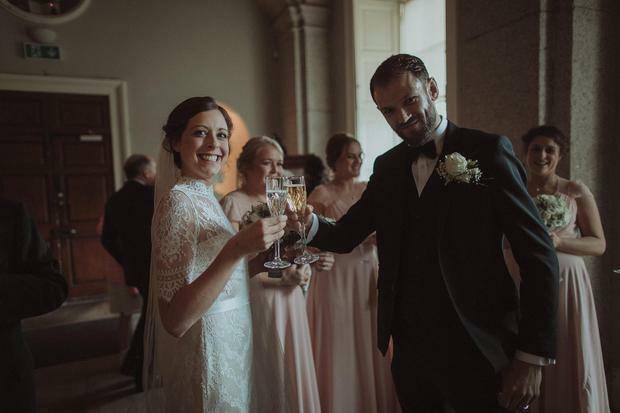 The couple got engaged in Paris - their favourite city - when Hughie got down on one knee in the romantic Tuilleries Garden on New Year's Eve and asked Gráinne to marry him. 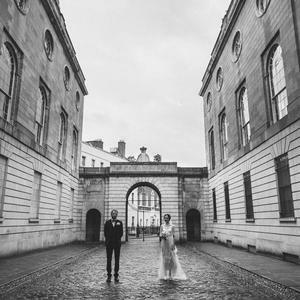 After that they set about planning a big day in Dublin "with an old school spread sheet and lots of advice from good friends", where guests could be close to home. 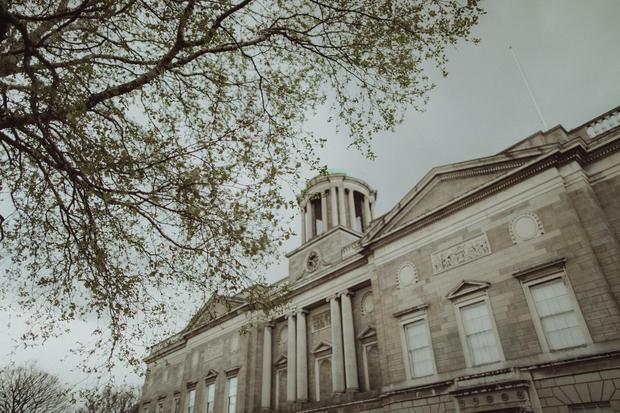 They exchanged vows in Trinity Chapel, before heading to Honorable Society of King's Inns, where it was all about the food, drink, and dancing into the wee hours. 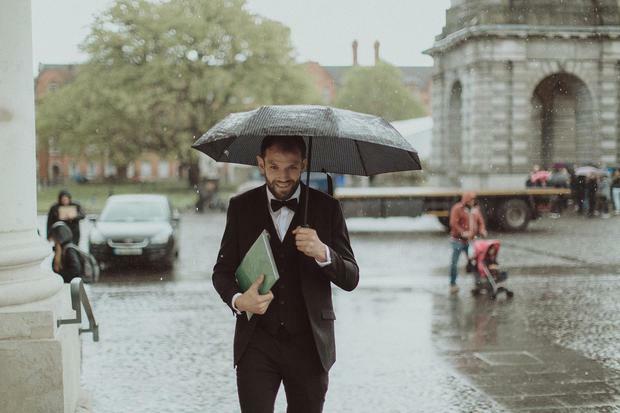 "I would say overall it was quite a traditional wedding," said bride Gráinne. "Simple and classic décor." While on the face of it, the couple seemed to pull off a seamless, beautiful event, Gráinne admits that it didn't happen by chance. "I definitely did not enjoy the planning - so time consuming! I would give anything to do the whole day over again but only if I had a wedding planner!" 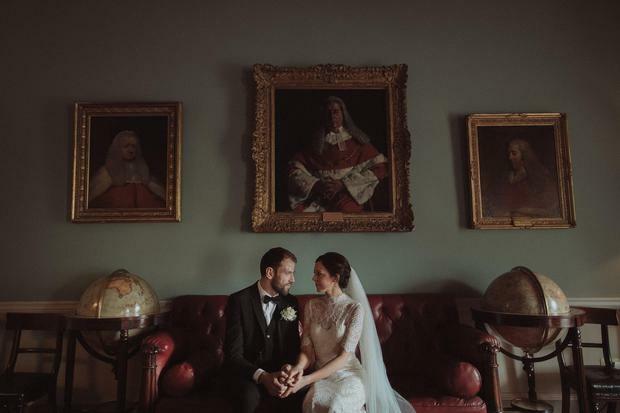 "I left all the décor down to the wonderful Claire Hanley in the Kings Inns, and Hughie’s sister Katie made us an amazing wedding cake." 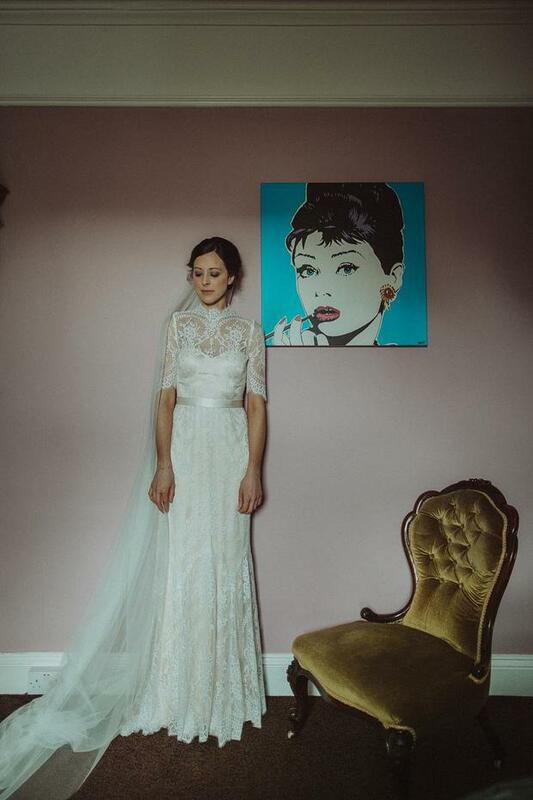 Gráinne's lace Victorian-inspired Charlotte Deane gown was from Alice May Bridal in Kilternan. "I enjoyed wedding dress shopping," she said. "I went to one shop and tried on two dresses, the second dress I bought! A very quick process! 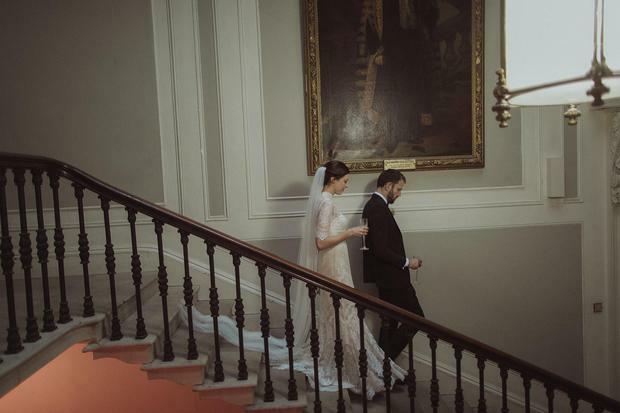 Alison and the other staff in Alice May Bridal were a pleasure to deal with," she said. 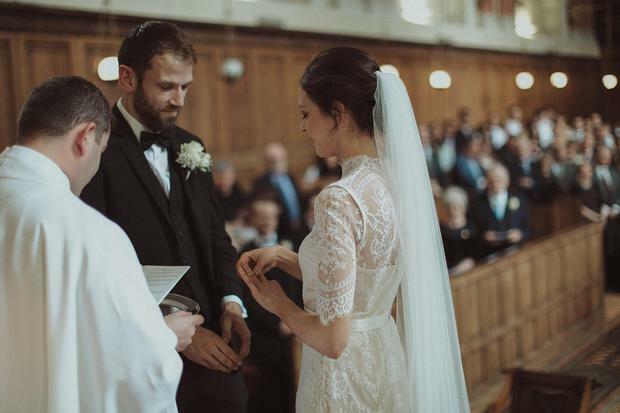 The couple had a traditional Catholic church ceremony in the chapel in Trinity College. 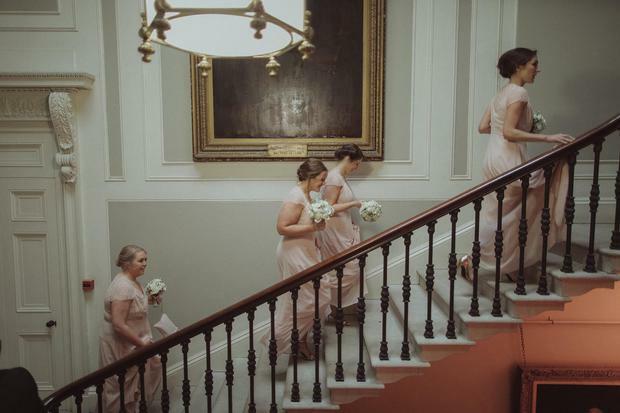 "Walking up the aisle as a married couple to Jenny McCabe singing ‘All you need is love’ (The Beatles) was one of my favourite moments," said the bride, "and looking at all of our loved ones in the church!" 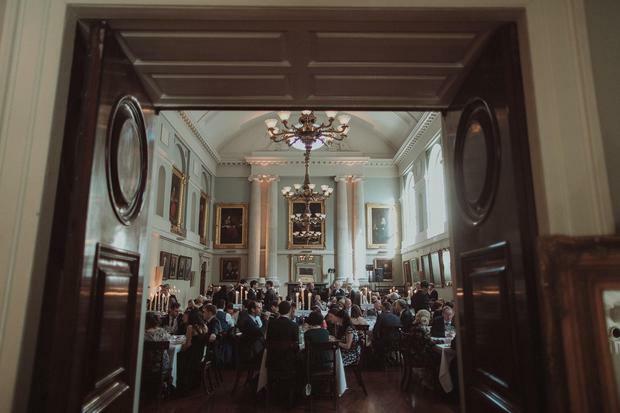 The couple held their reception in Honorable Society of King's Inns, a venue the groom's family had a connection with. "We love the building and we loved that it was Dublin based and that everyone could hop in a taxi home after the celebration!" 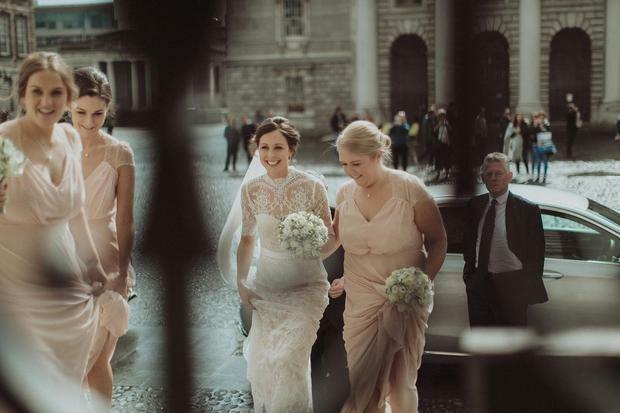 Gráinne and her bridesmaids took to ASOS to find a dress that everyone loved. "As everyone was a different shaped I used a fantastic dressmaker Orla Brady in Killester who fitted the dresses perfectly to each individual person." The groom and groomsmen got their suits in Lovesuits based on D’Olier Street; "a brilliant service," the bride adds. The food and drink was extremely important to the couple for their guests, and so they put lots of effort into making their menu really stand out. They served gin and tonics, beer, wine and Prosecco for the drinks reception. For the main meal they had pea and mint veloute, seafood assiette, rare fillet of angus beef. For dessert it was a groom and bride's choice dessert, petit fours. In the evening there was a cheese table, bacon bla’s and fish and chips. "We loved everything! The meal was a highlight. I also loved dancing with everybody until the wee hours." After two relaxing nights in The Shelbourne Hotel in Dublin, Hughie and Gráinne traveled to Thailand for their honeymoon. They visited Bangkok, Koh Samui and Koh Tao. "Our advice would be to enjoy your day. So much effort goes into the planning so it’s important to make the most of your day, try not to worry about anything once the day has begun (as it’s too late anyway)." "We wouldn’t change anything about the day, we were very happy with how it went. We would possibly not leave some aspects of the planning till last minute, work ahead on church paper work etc."